This blog provides you an overview of key highlights in the area of Sourcing & Procurement of our SAP S/4HANA 1709 release. Our 1709 release comprises a lot of innovations that bring tremendous value to procurement organizations. Sourcing & Procurement is one of the front-runners in adopting new technological innovations. 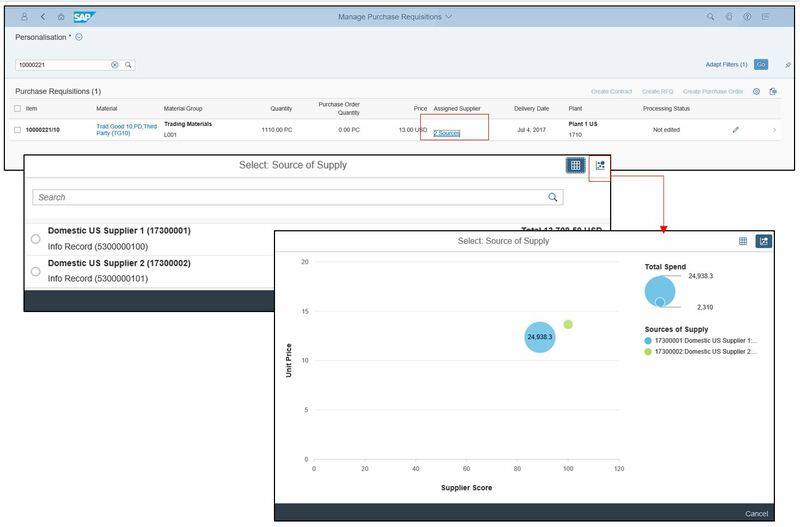 This is very true for our 1709 release as Sourcing & Procurement is the first LoB making predictive analytics available to SAP S/4HANA customers. 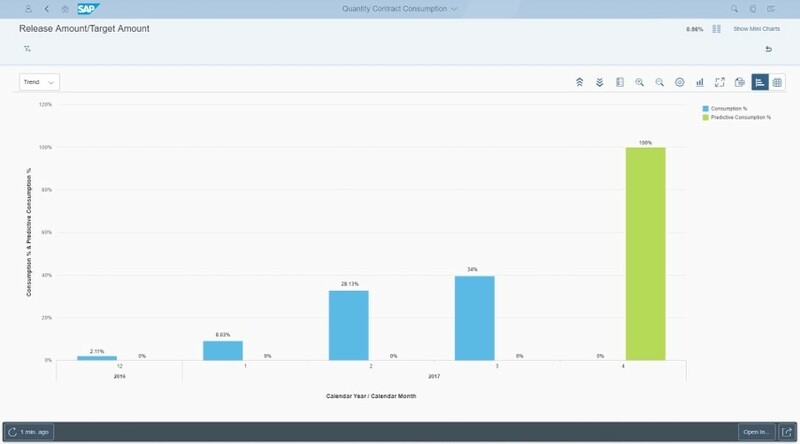 As part of the current release, SAP leverages predictive analytics in the area of contract consumption. 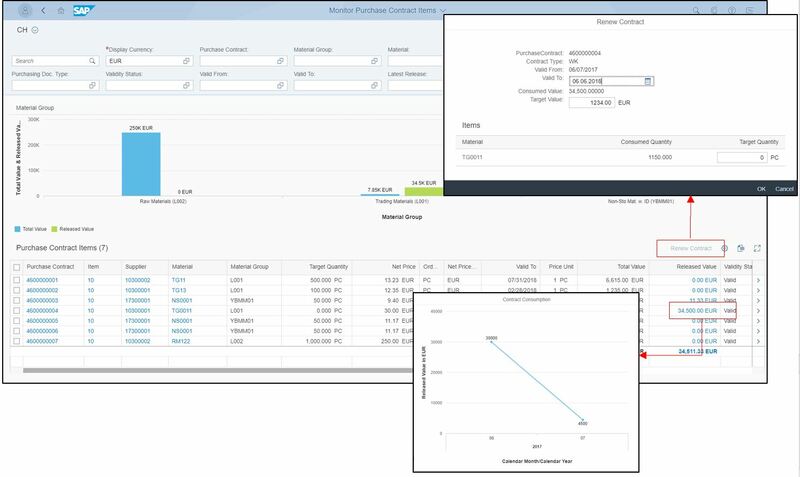 Based on the historical data stored in your SAP S/4HANA system, the application will calculate when a purchase contract is likely to be consumed by 100%. With this forecast, purchasers are enabled to renegotiate purchasing contracts in due time. As a consequence, you can achieve a better price for your additional spend! The estimated consumption date is displayed in the “Quantity Contract Consumption app” both graphically and numerically. Another main highlight of our 1709 release is legal content management. With SAP S/4HANA for legal content, users can create and manage all legal documents which they require for their business transactions, such as non-disclosure agreements, contracts with customers and suppliers, policy statements, etc. Based on the new functionality you have a central repository for all legal transactions together with their proper documentation. As a first step, we have integrated SAP S/4HANA for legal content into purchasing contracts and RFQs. For procurement departments it is crucial to ensure legal compliance to both company policy as well as state law. While this is applicable to virtually all companies in all industries, there are some industries where legal compliance and protection is even more critical, such as automotive or high tech. In general, every company that builds their unique competitive advantage on intellectual property requires to protect this intellectual property thoroughly in order to outsmart competition. Whenever such companies form alliances with other companies, subcontract certain steps of their production, or purchase products with unique specifications, they need legally sound and well documented non-disclosure agreements in place. With SAP S/4HANA for legal content, customers can ensure the protection of sensitive data whenever they send RFQs to possible suppliers. 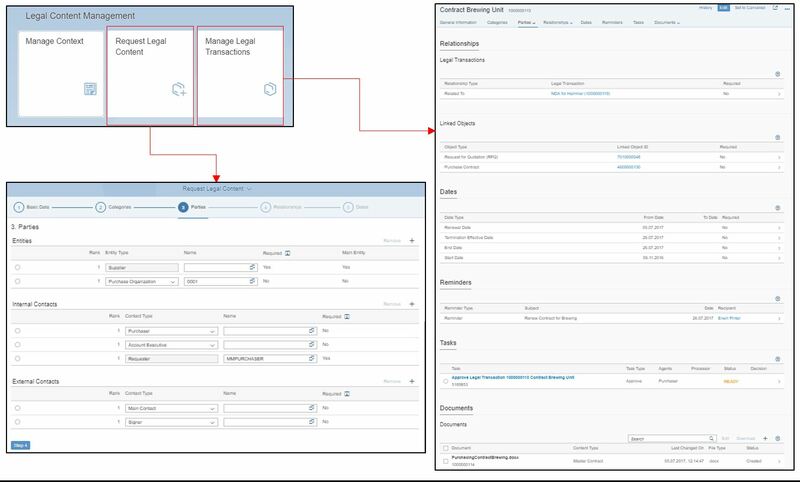 Legal clerks can easily assemble non-disclosure agreements for a respective RFQ by clicking on the new “Request Legal Content” tile in the Legal Content Management section on the Fiori Launchpad. To cut back on costs, today the majority of large and midsized companies have shared service centers for procurement or implemented centralized buying departments. Those companies require a central hub deployment for their purchasing activities. With SAP S/4HANA 1709 we take the first step to deliver a central hub deployment for procurement by enabling it for purchase requisitions. Now customers can connect different SAP ERPs to their central SAP S/4HANA system, which will serve as the hub system for centralized purchase requisitioning. Being connected to each other, all systems will share the required data (transactional & master data) to carry out the central requisitioning. For procurement organizations the central hub deployment brings about many benefits. In large multinational corporations, all employees worldwide can be connected to a central requisition application. This means that all employees benefit from a unified user experience across the entire organization. More importantly though, all employees, even those in subsidiaries running any SAP ERP, have access to one shared global catalog for purchasing. In that manner, employees have access to a wider variety of both goods and suppliers than what they can rely on with localized buying departments. In a similar manner, the approval of purchase requisition will be handled centrally as well. Overall, the Central SAP S/4HANA Procurement Hub translates into many benefits for large enterprises, among those are substantial cost savings, more satisfied workers and a streamlined user experience. Bear in mind that this is only the first step. With upcoming releases, we enable the central procurement hub also for purchasing contracts, current planning is 1802. For operational procurement, we bring a new business workflow across purchasing documents. 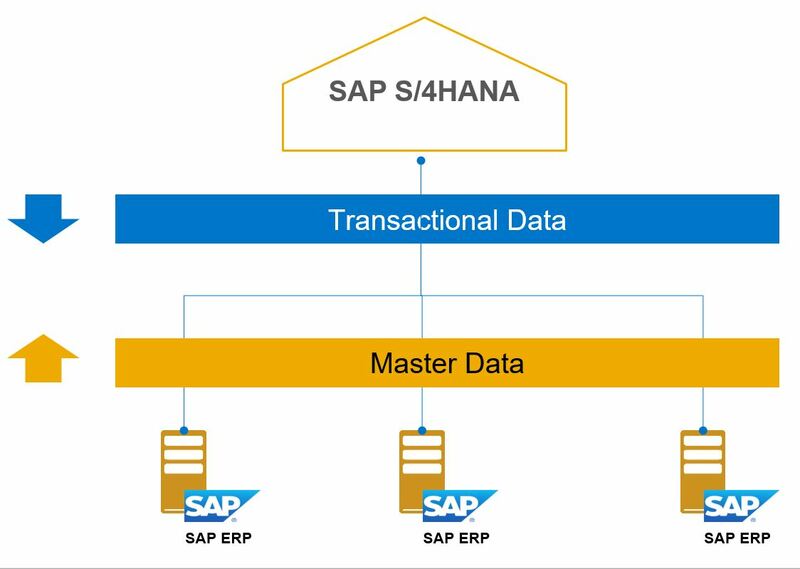 With SAP S/4HANA 1709 you can easily setup business workflows for a number of different purchasing documents, such as purchase requisition, purchase order, supplier quotations and supplier invoice. For each document type, SAP developed a distinct SAP Fiori App that users can use to configure the workflow for the business object (e.g. “Manage Workflows for Purchase Requisitions”). With the app, customers can setup both dynamic and flexible approval rules. Due to the intuitive user interface, users don’t require any programming skills in order to set up the business workflow. In the apps, you can choose dynamic start conditions (labeled as preconditions), such as total net amount higher than x, certain material groups, document types, purchasing groups and others. Subsequently, you can define the steps you want the workflow to follow (labeled as step sequence). Overall, you can define n-steps and you are also flexible with the number of approvers. 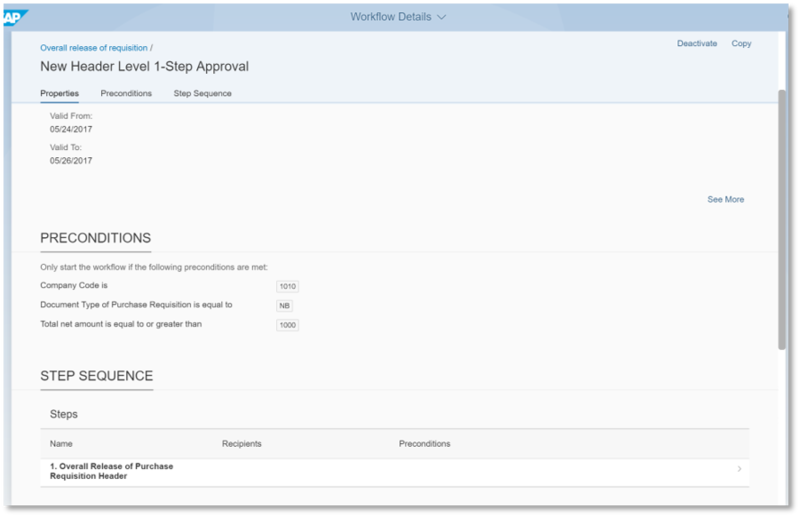 With regards to the workflow approvers, you can state whether all approvers are required to give their approval or whether one of them is sufficient. For every workflow that has been created, it is possible to define a validity time frame. As a small side note, it is not possible to mix release strategy and flexible workflow for the same document type. To conclude this update, I would like to point out other enhancements than the predictive analytics functionality in the area of purchasing analytics. SAP constantly enhances the embedded analytics offering as part of SAP S/4HANA. This also holds true for the procurement area. While 1709 entails many advances in purchasing analytics, I would like to pick out two of them. The first highlight is in the source of supply determination. Already a while back, SAP S/4HANA would propose you appropriate suppliers to source products when you were creating a purchase requisition. With 1709, this functionality is extended and embedded analytics provides more information to make a better selection concerning the supplier for a purchase requisition. If you click on the analytics button, an embedded analytics chart will appear. This screen displays how the suppliers that are available for the certain product are rated in terms of price, evaluation score and spend. Using this embedded analytics chart, the purchaser can make a better decision on the supplier that shall source the product needed. The second analytics innovation is regarding purchasing contracts. To get an overview of all existing contracts including the most important information, such as the released value, pertaining to the contract the “Monitor purchase contract items” is available. As part of the new release, when you click on the released value an embedded analytics screen will open that depicts how much value has been released over time. With this trend chart, purchasers can quickly identify any volatilities and whether one needs to take actions to mitigate any risks resulting from extreme volatile spending behavior. Using this information, purchasers are again enabled to make better decisions on how to deal with the underlying purchase contract. If a user sees fit to renew the contract, the user can do this directly in the app as well – no need to launch the “Manage purchase contract” app. Both analytical highlights make it apparent that SAP is constantly delivering on the statement that with SAP S/4HANA we are moving from a system of records to a system of intelligence and follow the instant insight to action paradigm. With this purchasing organization can become even more effective. Hello, Can you please direct me to “What’s New” of S4 1610 guide. I was wondering, what happens with FIORI approval apps, that have been used upto 1610. Example requisition approval, PO approval etc..
Are they going to be replaced by new apps?